A suspenseful, passionate, paranormal romance that sweeps through the emotions of first love and heartache as it traverses centuries and continents.Michelle used to feel like she was behind in everything, especially school and relationships. Her great aunt from the old country says she is like a bland meal, "no salt or pepper". But in junior year, everything changes. Her father takes a position on the Town Council, a popular boy in school becomes interested in her, and most importantly, the Hekademos Learning Center, a private school for 'troubled' students, moves into her quiet neighborhood amidst the protests of the entire town.After an embarrassing fall over the school wall, Michelle meets Elliot and her ordinary ‘bland’ life changes its course forever. Michelle learns that there are infinite shades of gray between black and white, and has to deal with the bundle of contradictory emotions called love. She has to trust her intuition in order to face the danger and uncertainty of being drawn into Elliot’s wondrous world. Ultimately, it is up to Michelle to make the split-second, life-altering decision that will either tear them apart forever, or give them another chance. 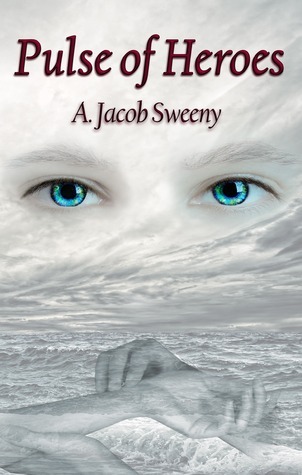 A. Jacob Sweeny's Pulse of Heroes is the kind of story that keeps you entertained. The elements of mystery and romance mesh perfectly while readers follow Michelle through her experience with strange, and dangerous, immortal beings. Without the extraordinary students of the Hekademos Learning Center, I would have thought Pulse of Heroes to be an easy contemporary love story. Part 1 focused solely on the development of Michelle and Elliott's relationship, and even her relationships with other characters. It wasn't necessarily full of background information, because Sweeny mentions the characters' pasts all throughout the story, but more of a daily recounting of Michelle's everyday life. While I was curious during part 1, and found the development interesting, I didn't feel like the story picked up until part 2. This is the time when all the action begins and the enemy is introduced and recognized. It seems the pacing of the story is kicked up a notch, also. Pulse of Heroes only opened a new chapter in Michelle's life. Based on the last few scenes of the story, it seems that there are still issues with her newfound life that she hasn't yet come to terms with. I'm extremely curious to see where this Pulse Myths Series is going. Michelle looked up at Elliot just as his arm rounded above her waist. She tilted her head backwards. She wanted him to kiss her. Elliot was also feeling drawn to Michelle. His hands, however, were unsure. He couldn’t make up his mind if he should hold her or not. Having her so close made him uncomfortable. Elliot looked down at Michelle’s face, then at her hair, and her eyes, and then her lips. She was very pretty, he had to admit that to himself, and he also had to admit that to avoid kissing her was a battle. Michelle closed her eyes, which only gave Elliot even more time to look at her up close. He could feel her warm breath reaching up to his, inviting him to join hers. They stood like that in an embrace that wasn’t for what felt like an eternity. Michelle slowly began to open her eyes just as Elliot closed his and leaned in to kiss her. She closed her eyes again and waited to feel his lips on hers. Their lips touched, but just barely, when Michelle’s cell phone sprang into life again. Sweeny, A Jacob (2010-10-31). Pulse of Heroes (p. 121). Thalamus Press. Kindle Edition.